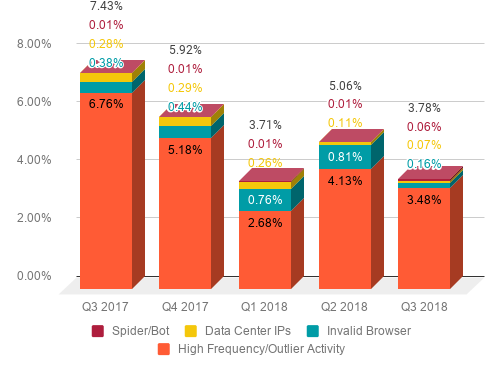 The filtered rate for General Invalid Traffic is trending down overall versus 2017. Q1 of this year saw a significant decline from the two previous quarters to an average of 3.71% for all GIVT. After bouncing up to 5.06% in Q2, the average in Q3 settled back at 3.78%. High Frequency/Outlier Activity continues to top the list of reasons for the vast majority, 3.48%, of filtered GIVT across the board. 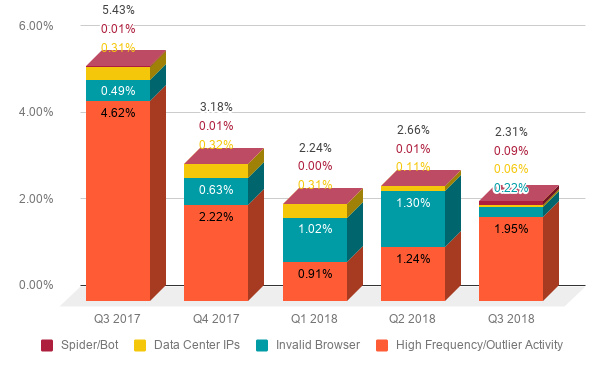 Among premium publishers, invalid browser activity decreased significantly in Q3 as a reason for filtering General Invalid Traffic. 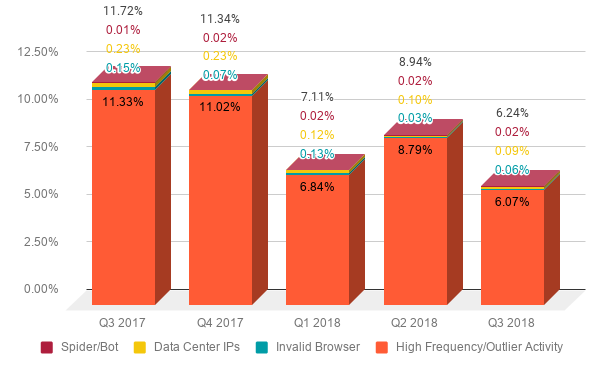 Hitting a high in Q2 of 1.30%, invalid browsers fell to just .22% among premium publishers in Q3. High Frequency/Outlier Activity resumed its place as the leading reason for GIVT. While it is trending up this year, High Frequency/Outlier Activity is down considerably from levels seen in 2017. High Frequency/Outlier Activity is consistently the leading reason for GIVT among media aggregators by a large margin. For the last year, GIVT has been on a downward trend for media aggregators, from a high of 11.72% in Q3 2017 to a new low of 6.24% in Q3 2018. Last quarter was the exception with an increase to 8.94%.